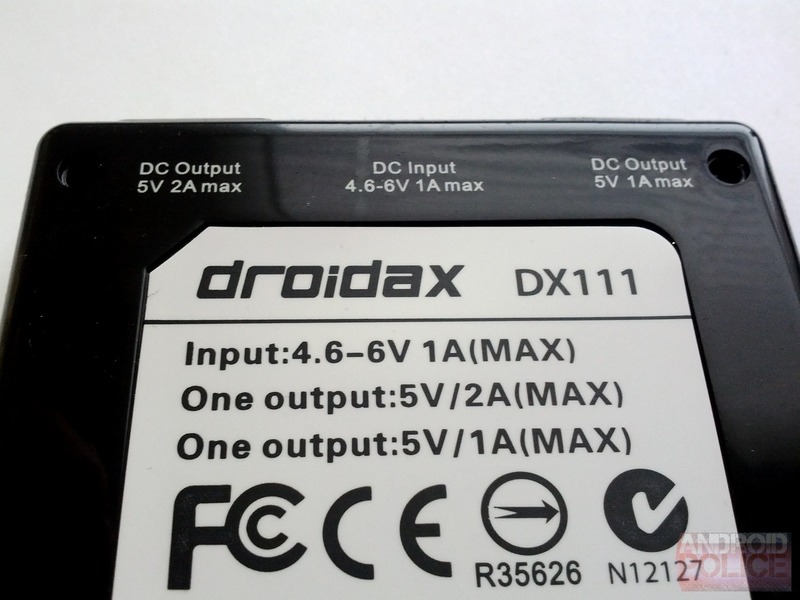 We've taken a look at a couple of portable chargers in the past, but the PortaCharge from DriodAX offers something that we haven't seen on any of its competitors: a digital display that outputs exactly how much juice the unit has (in percentage). 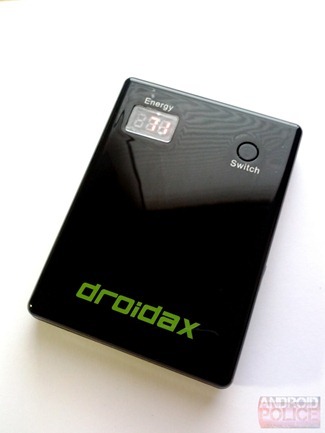 This gives it a definite advantage over its competition, as it addresses one of the biggest annoyances with other portable batteries and ensures that you always know when it's time to put it on charge. The question is, though, is a digital display enough to make this a winner? 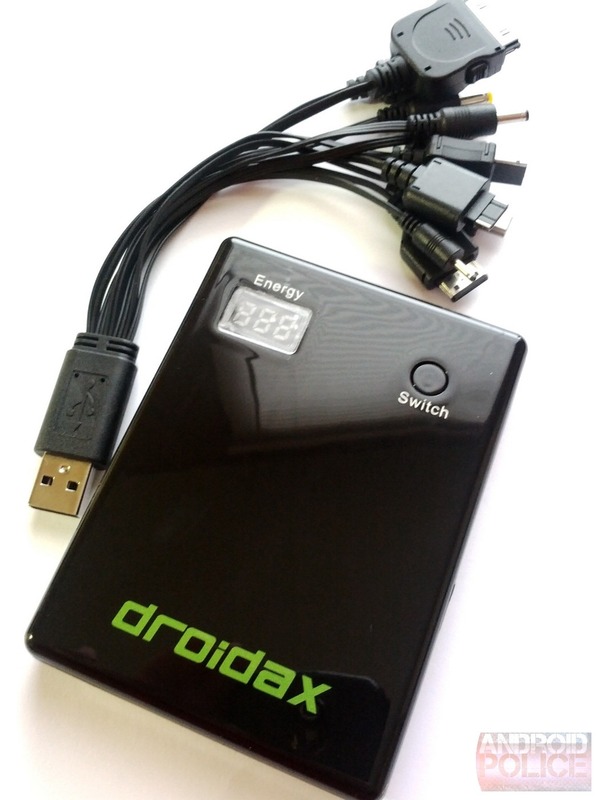 Price: $49.95, making this one of the most affordable portable chargers on the market. The Bottom Line: The PortaCharge has some unique features and a low price tag for what it offers. However, some corners were definitely cut to get the price so low - it feels cheap and the overall build is "sloppy." Still, if you're looking for an affordable way to keep your gear juiced on-the-go, the PortaCharge is a viable option. 5,400mAh - That's enough to charge a 1,500mAh battery over three times. The Digital Display - Ensures you always know exactly how much juice is left, which is a godsend if you're going to be away from an outlet for an extended amount of time. Weight - The unit is lightweight compared to similar products, so you can toss it in your bag without adding much extra bulk. 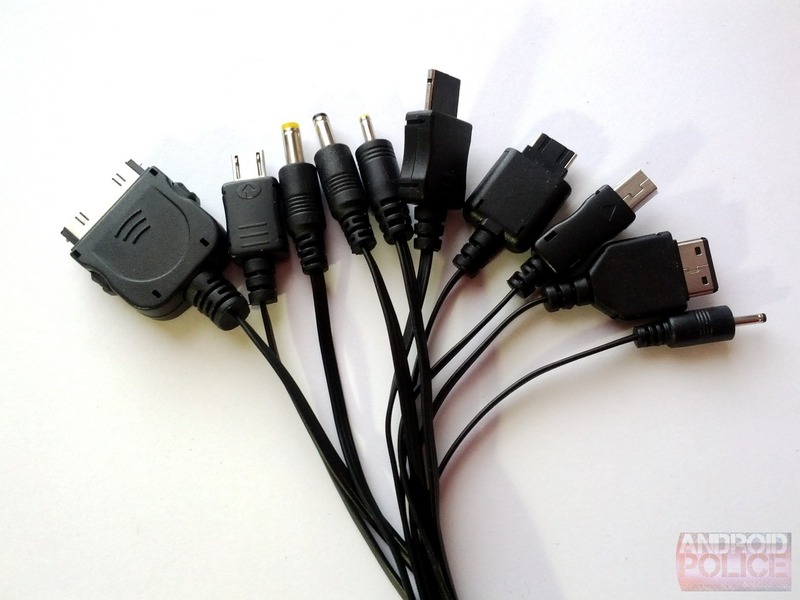 The included multi-headed USB cable can charge multiple devices, including those with microUSB or miniUSB, iPad/iPod/iPhone, and several others. Price - At $50, the PortaCharge is more affordable than competing products. Dual Charging Ports - Two ports, two times to the charge. One clocks in at 2 Amps, while the other offers a much slower charge at only 1 Amp. Build Quality - The low price point takes its toll on build quality. The unit feels slightly cheap in-hand, and certain aspects of build are sloppily done. 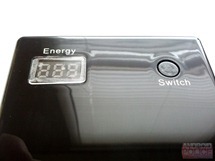 For example, the clear cover on the digital display on my unit is crooked, and you can see the glue all around it. The small rubber feet on the bottom of the unit that are supposed to keep it from sliding around have all fallen off - three of which were gone on the first day. Don't get me wrong, it doesn't feel as if it's going to fall apart in my hands, but the overall lack of attention to detail isn't very reassuring. 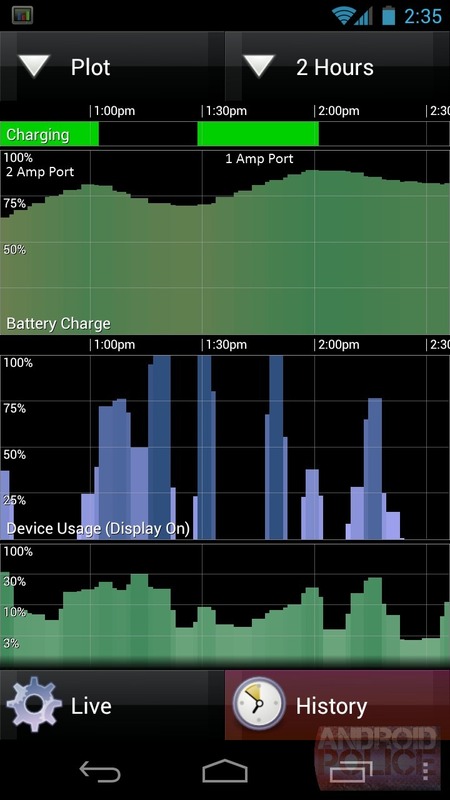 Charge Time is terribly inconsistent. It charges very rapidly up to the 80% mark, then slows to a crawl. No Tablet Support - While 5,400mAh may be enough to juice up a tablet (at least somewhat), it wouldn't charge my Galaxy Tab 10.1 or Acer Iconia A100. The former acted as if I had plugged it into a computer, while there was not a compatible adapter for the latter (it doesn't charge over USB). Multi-Headed USB Cable - It's a minor annoyance, but the heads of the USB cable get tangled together all the time, making it difficult to quickly grab the one that you need. 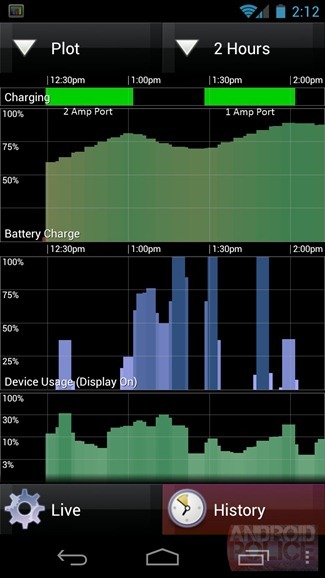 This is the nitty-gritty of what this device is all about: charging. I've charged my phone using it a few times now, and I honestly don't see a big difference in charge time compared to a standard wall outlet. As you can see, the leftmost green bar represents the charge from the 2 Amp port, whereas the rightmost bar is the charge provided by the single-amp port. 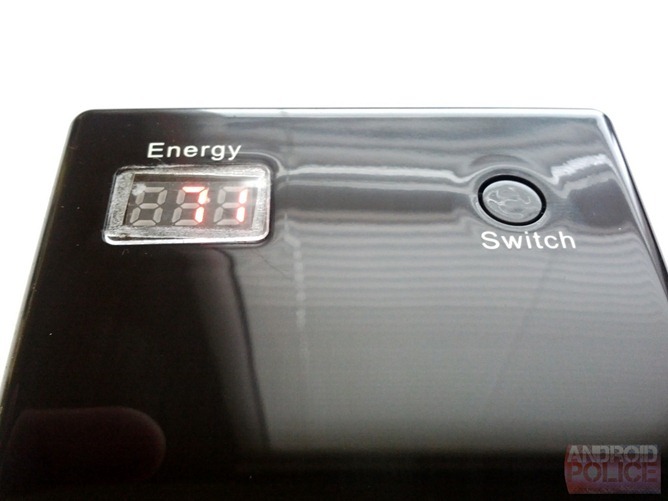 As expected, the 2A port does charge the device faster, but, surprisingly, it's not a huge difference over the 1A port. Of course, the total charge time depends on the device and how large the battery is, but, as I stated earlier, you probably won't notice a huge difference compared to the time that it takes to charge your device from a regular wall outlet. At the end of it all, I have mixed feelings about the PortaCharge from DroidAX. In fact, I've never been so torn about how I feel about a particular device. On one hand, it's an affordable and lightweight unit that performs quite well and packs a decent amount of extra battery life for your phone. On the other, the build quality leaves much to be desired and it won't charge a tablet. With that said, do I recommend the PortaCharge? It depends. 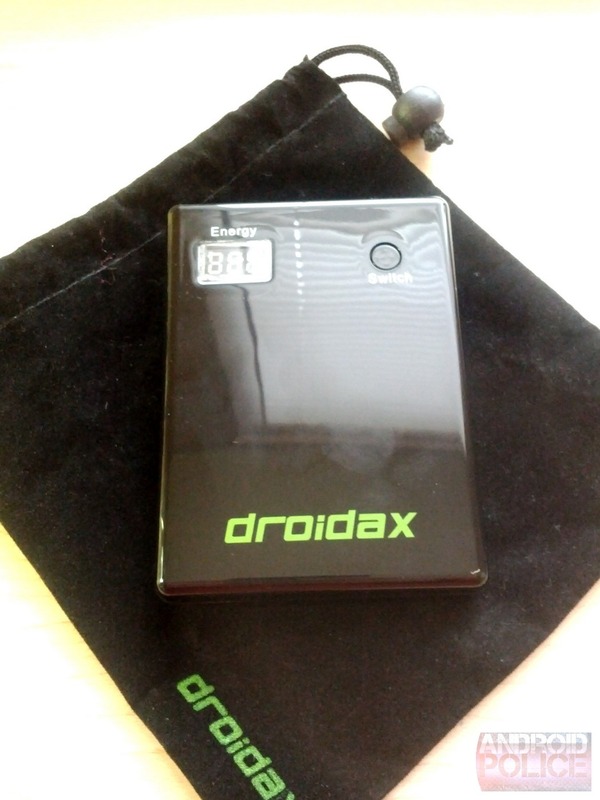 If you need a way to charge your phone (or iPod, I suppose) while on-the-go without breaking the bank, this is a good unit - if you can accept sub-par build quality, that is. If you need something that will charge a tablet or are a stickler for perfection (as I am), however, I suggest that you look elsewhere.